Among the sharp looking concepts at the 2013 Detroit Auto Show was the Fiat 500 Cattiva – a model which the company has recently confirmed would see production even though no time frame for availability has been offered. While speaking with a group of journalists, Fiat North America boss Jason Stoicevich confirmed that the company does plan to offer a production version of the Fiat 500 Cattiva Concept that we met in Detroit. "I can guarantee you it will happen. I just can't tell you when,” said Stoicevich. While that is a bit vague, that comment seems to be about as concrete as it gets when it comes to an auto boss talking about a previously unmentioned future product. The Fiat 500 Cattiva Concept that debuted earlier this year in Detroit was predominantly an appearance package backed on the new Fiat 500 Turbo. The biggest impact was on the outside where a gorgeous Rame (Italian for copper) deep metallic paint has been applied to the Abarth-like body cladding featuring a black roof and a black rear spoiler. This glowing paint is joined by dark headlights, dark fog lights, black chrome trim and 16” black chrome aluminum wheels to provide a menacing, sporty look. On the inside, the Cattiva Concept featured black leather sport seats, a leather wrapped shift knob, a leather wrapped steering wheel, silver accent stitching throughout and a Beats Audio system. The Cattiva was powered by the turbocharged 1.4L Fiat engine packing 135 horsepower and 150lb-ft of torque with that power being channeled to the front wheels via a similar heavy duty 5-speed manual transmission to the one from the high performance Abarth. Improving the performance is a sport tuned suspension and a performance tuned braking system. There was no word on how much the production version of the Fiat 500 Cattiva would cost but if you look at the features added, they are all very simple things on the outside and a bunch of leather that is already available on other models inside so there really shouldn’t be a huge price hike between the 500 Turbo and the 500 Cattiva. 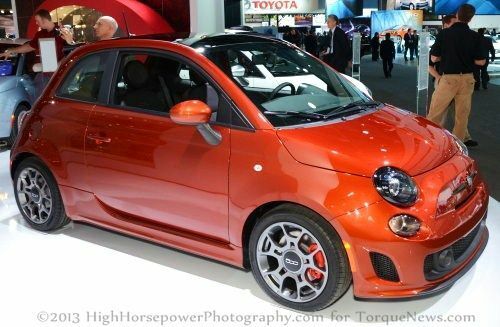 When it reaches production, we would expect that the Cattiva would serve as a great step up for those who want a more performance minded appearance than that offered by the 500 Turbo but they do not want the price increase or the higher performance attributes of the 500 Abarth. While this likely won’t be a high volume package – the company’s ability to offer more variations will allow this sport, affordable subcompact to appeal to more and more buyers. Ultimately, if you can throw a new exterior paint option and a bunch of features already in the company parts bin to create a new appearance package without a huge price increase, why not do it? In case you were wondering what “Cattiva” means…a quick search of an Italian-English translation program reveals that it has a variety of meanings. When used as a noun, cattiva refers to a villain, scoundrel or a wicked person while in adjective form, cattiva refers to something that is bad, evil or wicked. This means that if the company sticks with the concept name when the model goes to production – they will literally have a car called the Fiat 500 Villain. Needless to say, it sure sounds a lot nicer as the Cattiva but the sinister translation of the model name is fitting of a vehicle that offers such an aggressive exterior countenance.